Granite Reclining Desk Headstones supplied by J.H. Wagner & Sons. Granite Reclining Desk Headstones from J.H. Wagner & Sons are available in stock colours of Black, Grey, Red, Light Grey, Yellow, Blue Pearl, Emerald Pearl and Darwin Brown granite, or we can manufacture Granite Reclining Desk Headstones from our granite blocks allowing for an even larger colour palette. Small marker desks, medium and large size desks, scroll desks and Book desks are each available within the JHW range. Select an inscription sandblasted into the granite, Laser Etched onto Black granite or perhaps design a bronze plaque to be attached onto the face. 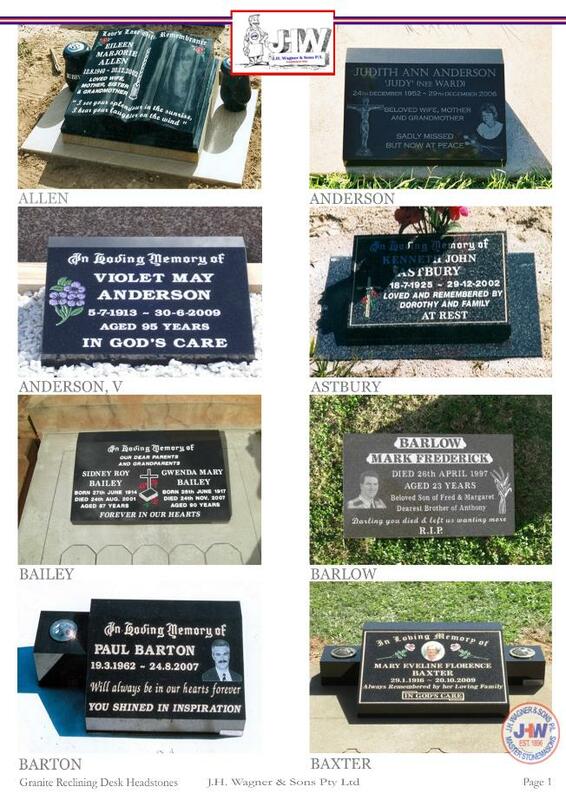 While granite is the hardest material in our reclining desk headstone range the options of colours and sizes permits Granite Reclining Desk Headstones to cover budget memorials up to the most elegant of designs.